If you have ever experienced a sinus infection, you know all about the pain and discomfort that it can cause. All you want is immediate relief, so what are the best home remedies for sinus infections? First, let’s discuss the factors behind this unpleasant infection. A sinus infection is also known as sinusitis. It occurs when the cavities around your nose are swollen and inflamed. Sinusitis can be triggered by a virus, allergies, a deviated septum, a tooth infection, or in rare cases, bacteria or fungus. There are two main types of sinusitis: chronic and acute. With acute sinusitis, the infection is usually part of a cold or allergies—it will generally last for a short period of time. A chronic sinus infection typically lasts for more than eight weeks. Acute and chronic sinus infections have very similar symptoms, so the best way to find out if you have an infection is to see your doctor. But before you request a round of antibiotics, you may want to consider the following potential home remedies for sinus infections. This is a protein-digesting enzyme sold as a supplement. Research indicates that bromelain can help with a speedy recovery of acute sinusitis. It can help reduce the swelling in the nasal passage, but you should speak to your doctor first. Bromelain could interact with other medications you may be taking. Saline sprays and washes, such as a neti pot, will help thin out the mucus and flush it out of the nasal passage. Research also shows that using a neti pot can eliminate some chronic sinusitis symptoms and maintain a positive outcome for six months. 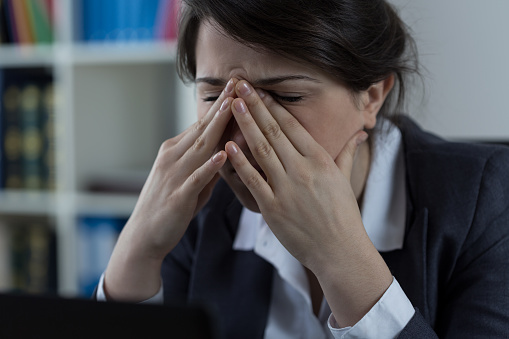 In addition to the improved sinusitis symptoms, there was less use of over-the-counter drugs, headaches were reduced, and people also said they were less likely to have another sinusitis attack. Using a saline solution can restore moisture to the nasal passages and reduce inflammation. Staying hydrated will also restore moisture to your sinuses and keep them moist. Try to consume at least eight 8-ounce glasses of water a day. One trick to tell if you are drinking enough fluids is if your urine is clear. Hot water vapor can moisten the sinuses. Taking a hot, steamy shower or bath can help loosen the mucus and debris that is stuck inside your nasal passages. Consuming spicy foods, such as hot peppers, mustard, horseradish, curry, and wasabi, can help clear the nasal passages. Fill a pot with boiling water and place your face over it, but not too close where you could burn yourself. Place a towel over your head and inhale the steam. Allergies can make the sinus pain considerably worse and cause it to flare up. Use dust covers on your pillows and comforter. If you have a pet, do not let it sleep in the bedroom. A humidifier will keep the air moist and clean, but be sure that you keep the humidifier clean. Do not use it during humid months, only dry months. Humidity levels should be between 35% and 50% in the home. One way to tell if the humidity level is too high is if the windows begin to fog. If natural remedies don’t help with the sinus pain, your doctor may perform a CT scan of your nose and sinuses to look for blockages. If your sinus pain lasts for over a week and you have also developed a fever, you should see an ear, nose, and throat specialist. A more aggressive form of treatment may be required. Your body can become resistant to antibiotics if you use them when not needed. Antibiotics are sufficient at killing bacteria, but not viruses. In most cases, sinusitis is triggered by a virus, so antibiotics may not work. Seek advice from a medical professional. Home remedies for sinus infections also include essential oils, such as lemon oil, lavender, oil, eucalyptus oil, and peppermint oil. High-quality, food-grade essential oils help clear mucus, open the sinuses, and eliminate sinus infections. Rub one drop of a couple of the essential oils on the roof on your mouth, and then drink some water. Alternatively, massage essential oils onto your temples, neck, and back of your neck. You can also diffuse essential oils and breathe them in. Raw honey is another great home remedy for sinus infections. This is because the antimicrobial properties in honey make it beneficial for soothing your throat and nasal passages, which are inflamed during a sinus infection. For an effective remedy, combine one tablespoon of raw honey and one to two teaspoons of fresh lemon juice. Warm this mixture for a few seconds, and consume immediately. The antifungal, antiviral, and antibacterial properties of grapefruit seed extract make it effective for the underlying infection that causes sinusitis. This is why grapefruit seed extract is found in various throat and nasal sprays. Naringenin and limonoids are polyphenol compounds in grapefruit seed extract believed to be responsible for treating infections. How do you use grapefruit seed extract? There are several teas that are beneficial for a sinus infection. One tea in particular includes two teaspoons of honey, a small lemon wedge, a cup of boiling water, and a half-teaspoon of cayenne pepper—a natural decongestant that contains the chemical capsaicin. You will add the honey, lemon, and cayenne pepper to the hot water, and mix well. Sip tea warm. Drink two to three herbal teas daily for optimal sinus infection relief. Ginger tea and green tea are also good for the relief of sinus infections. Horseradish is a root vegetable often used as a spice on meats like roast beef. The antimicrobial properties in horseradish help eliminate the fungus or bacteria that causes a sinus infection. One 2013 study suggests that the isothiocyanates extracted from horseradish root contain antimicrobial properties. It is effective to ingest a half-teaspoon of horseradish three times daily for sinus infection relief. Echinacea is an often recommended herb and natural treatment for sinus infections. Research shows that echinacea contains antiviral properties. As a result, echinacea reduces inflammation, pain, and sinus infections. The immune-boosting and anti-inflammatory properties of echinacea are able to relieve upper respiratory symptoms, such as acute sinusitis. It is a good idea to take 1,000 mg of an echinacea supplement two to three times daily. Although sinus infections are common, there are home remedies for sinus infections that can help. Common sinus infection symptoms include a thick green-yellow nasal discharge, pain around the eyes and cheekbones, and clogged nasal passages. In this article, we discussed several home remedies, including flushing your nasal passage with a neti pot; drinking water; applying a warm compress or essential oils; or consuming bromelain, honey, grapefruit seed extract, echinacea, horseradish, and cayenne pepper tea, green tea, and ginger tea. Health Benefits of Pineapples: Sinus Relief and More! Park, H., et al., “Antimicrobial activity of isothiocyaates (ITCs) extracted from horseradish (Armoracia rusticana) root against oral microorganisms,” Biocontrol Science, 2013; 18(3): 163-168, PMID: 24077540. Scutti, S., “Study: Neti pots really do help chronic sinusitis,” CNN, last updated July 21, 2016; https://www.cnn.com/2016/07/21/health/neti-pot-sinusitis-saline/, last accessed September 16, 2018.